Total US plant milks grew by 7% in 2017 to $1.5-billion/€1.3 billion (IRI). 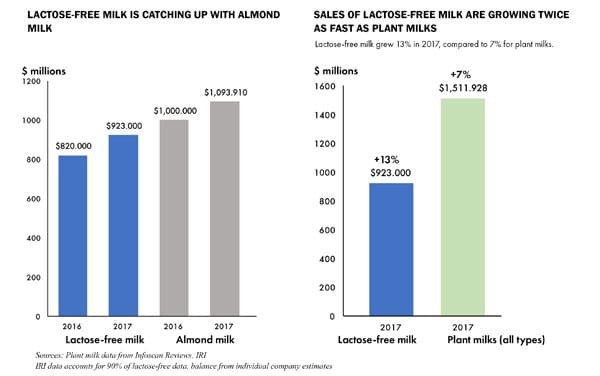 Almond milk, the biggest plant milk segment in the US with 75% of sales, grew 9.3% to $1.1-billion (€940-million) in 2017. But US sales of lactose-free milk grew an impressive 13% – almost double the rate of total plant milks – to more than $923-million (€789-million). At current growth rates, sales of lactose-free milk will equal those of almond milk by 2020. 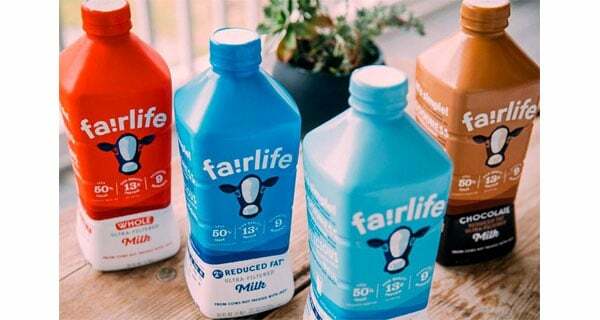 Fairlife debuted in 2015. By 2017 its annual sales were already $228-million (€192-million), despite selling at a 100% premium to regular milk and a 50%-60% premium to plant milk brands. Its success is helping drive growth in the lactose-free segment. But even the established market leader in lactose-free, Hood Dairy’s Lactaid, is doing well. Hood Lactaid sales rose a robust 4.9% to $575-million (€471-million), according to Symphony IRI. Dairies are doing a better job of marketing their lactose-free products, capturing the attention of people who like dairy’s inherent nutrition and prefer the taste. It’s largely Millennials who are driving the increase in consumer interest in lactose-free milks, especially Millennial parents, who understand that milk is nutritious and want their kids to have the taste and nutrition of real dairy. They also want to avoid upset stomachs so they’re looking for products without lactose. Cow’s milk has the advantage of versatility and can be used in drinks and in cooking more widely and easily than plant milks. The ingredient list of lactose-free milks compares favourably with the long ingredient lists of plant milks, which look to many people like an over-processed and not-very-natural product. Milk has one ingredient and its vitamins and minerals are naturally present. Many plant milks have 10, 15 or more ingredients – with added vitamins and minerals. And when it comes to the “plant” benefit, some consumers may wonder what the benefit really is from a product that’s actually only 6%-10% plant material. As for the digestive benefit – the biggest driver of growth of the plant milk market being consumers who believe that cows’ milk gives them bloating or other digestive discomfort – lactose-free milk provides the same benefit, thus eroding plant milks’ competitive advantage. Given the choice of a good-tasting lactose-free milk, more and more consumers are willing to choose dairy’s natural nutrition and shorter ingredient list over plant milks. Lactose-free milk is to plant milk as butter is to margarine – one natural, one highly processed. And we know how that story ended.